Rajiv Ratna Gandhi was an Indian politician who served as the 6th Prime Minister of India from 1984 to 1989. He took office after the 1984 assassination of his mother, Prime Minister Indira Gandhi, to become the youngest Indian Prime Minister at the age of 40. Junius Richard Jayewardene, commonly abbreviated in Sri Lanka as J. R., was the leader of Sri Lanka from 1977 to 1989, serving as Prime Minister from 1977 to 1978 and as the second President of Sri Lanka from 1978 till 1989. He was a leader of the nationalist movement in Ceylon who served in a variety of cabinet positions in the decades following independence. A longtime member of the United National Party, he led it to a landslide victory in 1977 and served as Prime Minister for half a year before becoming the country's first executive president under an amended constitution. The Liberation Tigers of Tamil Eelam was a Tamil militant organization that was based in northeastern Sri Lanka. Founded in May 1976 by Velupillai Prabhakaran, it waged a secessionist nationalist insurgency to create an independent state of Tamil Eelam in the north and east of Sri Lanka for Tamil people. This campaign led to the Sri Lankan Civil War, which ran from 1983 until 2009, when the LTTE was eventually defeated during the presidency of Mahinda Rajapaksa. Indian Peace Keeping Force (IPKF) was the Indian military contingent performing a peacekeeping operation in Sri Lanka between 1987 and 1990. It was formed under the mandate of the 1987 Indo-Sri Lankan Accord that aimed to end the Sri Lankan Civil War between militant Sri Lankan Tamil nationalists such as the Liberation Tigers of Tamil Eelam (LTTE) and the Sri Lankan military. Tamil Eelam is a proposed independent state that Tamils in Sri Lanka and the Sri Lankan Tamil diaspora aspire to create in the north and east of Sri Lanka. Tamil Eelam, although encompassing the traditional homelands of Sri Lankan Tamils, has no official status or recognition by world states. Sections of the Eelam community were under de facto control of the Liberation Tigers of Tamil Eelam (LTTE) for most of the 2000s. The name is derived from the ancient Tamil name for Sri Lanka, Eelam. Rejaul Karim Laskar is an Indian politician from the Indian state of Assam belonging to Indian National Congress. He is a Congress ideologue. He has written extensively in favour of UPA Government's policies.. He is also a prominent author and scholar of India’s foreign policy and diplomacy. The Indian intervention in the Sri Lankan Civil War was the deployment of the Indian Peace Keeping Force in Sri Lanka intended to perform a peacekeeping role. The deployment followed the Indo-Sri Lankan Accord between India and Sri Lanka of 1987 which was intended to end the Sri Lankan Civil War between militant Sri Lankan Tamil nationalists, principally the Liberation Tigers of Tamil Eelam (LTTE), and the Sri Lankan military. Indira Priyadarshini Gandhi, was an Indian politician, stateswoman and a central figure of the Indian National Congress. She was the first and, to date, the only female Prime Minister of India. Indira Gandhi was the daughter of Jawaharlal Nehru, the first prime minister of India. She served as Prime Minister from January 1966 to March 1977 and again from January 1980 until her assassination in October 1984, making her the second longest-serving Indian Prime Minister, after her father. Tamil Nadu is one of the 29 states of India. Its capital and largest city is Chennai. Tamil Nadu lies in the southernmost part of the Indian subcontinent and is bordered by the union territory of Puducherry and the South Indian states of Kerala, Karnataka, and Andhra Pradesh. It is bounded by the Eastern Ghats on the north, by the Nilgiri Mountains, the Meghamalai Hills, and Kerala on the west, by the Bay of Bengal in the east, by the Gulf of Mannar and the Palk Strait on the southeast, and by the Indian Ocean on the south. The state shares a maritime border with the nation of Sri Lanka. South India is the area including the five Indian states of Andhra Pradesh, Karnataka, Kerala, Tamil Nadu and Telangana, as well as the three union territories of Lakshadweep, Andaman and Nicobar Islands and Puducherry, occupying 19% of India's area. Covering the southern part of the peninsular Deccan Plateau, South India is bounded by the Bay of Bengal in the east, the Arabian Sea in the west and the Indian Ocean in the south. The geography of the region is diverse with two mountain ranges–the Western and Eastern Ghats, bordering the plateau heartland. Godavari, Krishna, Kaveri, Tungabhadra and Vaigai rivers are important non-perennial sources of water. Chennai, Bangalore, Hyderabad, Trivandrum, Coimbatore, Visakhapatnam, Madurai and Kochi are the largest urban areas. From 1985 however, the Sri-Lankan Government started rearming itself extensively for its anti-insurgent role with support from Pakistan, Israel, Singapore and South Africa. In 1986, the campaign against the insurgency was stepped up and in 1987, retaliating an increasingly bloody insurgent movement, Operation Liberation was launched against LTTE strongholds in Jaffna Peninsula, involving nearly four thousand troops, supported by helicopter gunships as well as ground attack aircraft. In June 1987, the Sri Lankan Army laid siege on the town of Jaffna. As civilian casualties grew,   calls grew within India to intervene in what was increasingly seen in the Indian (and Tamil) media as a developing humanitarian crisis, especially with reports use of aerial support against rebel positions in civilian areas. India, which had a substantial Tamil population in South India faced the prospect of a Tamil backlash at home, called on the Sri Lankan government to halt the offensive in an attempt to negotiate a political settlement. Faced with the possibility of an active Indian intervention and facing an increasingly war-weary population at home,  the Sri Lankan President, J. R. Jayewardene, offered to hold talks with the Rajiv Gandhi government on future moves. The siege of Jaffna was soon lifted, followed by a round of negotiations that led to the signing of the Indo-Sri-Lankan accord on July 29, 1987  that brought a temporary truce. The terms of the truce specified that the Sri Lankan troops withdraw from the north and the Tamil rebels disarm,  and saw the induction of the Indian Peace Keeping Force in Sri Lanka. 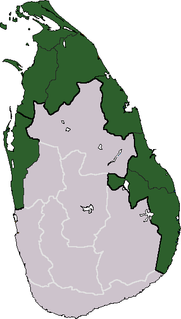 Among the salient points of the agreement,  the Sri Lankan Government made a number of concessions to Tamil demands, which included   Colombo devolution of power to the provinces, merger (subject to later referendum) of the northern and eastern provinces, and official status for the Tamil language. More immediately, Operation Liberation — the successful, ongoing anti-insurgent operation by Sri Lankan forces in the Northern peninsula — was ended. Sri Lankan troops were to withdraw to their barracks in the north, the Tamil rebels were to disarm. India agreed to end support for the Tamil separatist movement and recognise the unity of Sri Lanka. The Indo-Sri Lanka Accord also underlined the commitment of Indian military assistance on which the IPKF came to be inducted into Sri Lanka. The Tamil Eelam Liberation Organization (TELO) is an Eelam Tamil organisation campaigning for the establishment of an independent Tamil Eelam in the northeast of Sri Lanka. The TELO was originally created as a militant group, and functioned as such until 1986, when most of its membership was killed in a conflict with the Liberation Tigers of Tamil Eelam (LTTE). Its surviving members reorganised themselves as a political party, and it continues to function as such today. Anton Balasingham Stanislaus was a Sri Lankan Tamil journalist, rebel and chief political strategist and chief negotiator for the Liberation Tigers of Tamil Eelam, a separatist Tamil militant organisation in Sri Lanka. Shanmugalingam Sivashankar was a Sri Lankan Tamil rebel and leading member of the Liberation Tigers of Tamil Eelam, a separatist Tamil militant organisation in Sri Lanka. Operation Poomalai, also known as Eagle Mission 4, was the codename assigned to a mission undertaken by the Indian Air Force to air-drop supplies over the besieged town of Jaffna in Sri Lanka on 4 June 1987 in support of Tamil Tigers during the Sri Lankan Civil War. The Jaffna University Helidrop was the first of the operations launched by the Indian Peace Keeping Forces (IPKF) aimed at disarming the Liberation Tigers of Tamil Eelam (LTTE) by force and capturing the town of Jaffna, Sri Lanka, in the opening stages of Operation Pawan during the active Indian mediation in the Sri Lankan Civil War. Mounted on the midnight of 12 October 1987, the operation was planned as a fast heliborne assault involving Mi-8's of the No.109 HU, the 10th Para Commandos and a contingent of the 13th Sikh LI. The aim of the operation was to capture the LTTE leadership at Jaffna University building which served as the Tactical Headquarters of the LTTE, which was expected to shorten Operation Pawan, the battle for Jaffna. However, the operation ended disastrously, failing to capture its objectives due to intelligence and planning failures. The helidropped force suffered significant casualties, with nearly the entire Sikh LI detachment of twenty-nine troops, along with six paracommandos, falling in battle. Operation Pawan was the code name assigned to the operation by the Indian Peace Keeping Force (IPKF) to take control of Jaffna from the Liberation Tigers of Tamil Eelam (LTTE), better known as the Tamil Tigers, in late 1987 to enforce the disarmament of the LTTE as a part of the Indo-Sri Lanka Accord. In brutal fighting lasting about three weeks, the IPKF took control of the Jaffna Peninsula from the LTTE, something that the Sri Lankan Army had tried but failed to do. Supported by Indian Army tanks, helicopter gunships and heavy artillery, the IPKF routed the LTTE at the cost of 214 soldiers. Eelam War I is the name given to the initial phase of the armed conflict between the government of Sri Lanka and the LTTE. Although tensions between the government and Tamil militant groups had been brewing since the 1970s, full-scale war did not break out until an attack by the LTTE on a Sri Lanka Army patrol in Jaffna, in the north of the country, on July 23, 1983, which killed 13 soldiers. The attack, and the subsequent riots in the south, are generally considered as the start of the conflict. This fighting continued until 1985, when peace talks were held between the two sides in Thimphu, Bhutan, in hopes of seeking a negotiated settlement. They proved fruitless and fighting soon resumed. Operation Liberation or the Vadamarachchi Operation was the military offensive carried out by the Sri Lankan military in May and June 1987 to recapture the territory of Vadamarachchi in the Jaffna peninsula from the LTTE. It was the first conventional warfare engagement on Sri Lankan soil after the end of British colonial rule. The Battle of Jaffna was a battle fought from October to December 1995 for the city of Jaffna. India–Sri Lanka relations are generally positive with only 4% of Sri Lankans stating that they have a negative view of India - the lowest of all the countries surveyed by the Ipsos GlobalScan. The two countries are also close on economic terms with India being the island's largest trading partner and an agreement to establish a proto single market also under discussion at an advanced stage. There are deep racial and cultural links between the two countries, with the Indian cricket team holding widespread support on the island, and Buddhism and Hinduism being core values of both nations too.. India is the only neighbour of Sri Lanka, separated by the Palk Strait; both nations occupy a strategic position in South Asia and have sought to build a common security umbrella in the Indian Ocean. 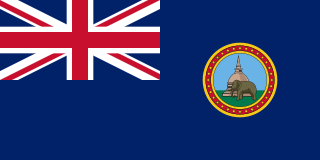 Both India and Sri Lanka are republics within the Commonwealth of Nations. The Jaffna hospital massacre occurred on October 21 and 22, 1987, during the Sri Lankan Civil War, when troops of the Indian Army entered the premises of the Jaffna Teaching Hospital in Jaffna, Sri Lanka, an island nation in South Asia, and killed between 60-70 patients and staff. The rebel Liberation Tigers of Tamil Eelam, the government of Sri Lanka, and independent observers such as the University Teachers for Human Rights and others have called it a massacre of civilians. The Eelam National Democratic Liberation Front (ENDLF) is a former Indian backed Tamil militant group in Sri Lanka. It was formed in 1987 as an amalgamation of splinter groups from other militant groups. It is currently a pro-government paramilitary group and political party. In August 2011 it was reported that the party is to be deregistered. Wijemuni Vijitha Rohana de Silva was a Sri Lankan sailor and an astrologer. He is noted for his assault on Indian Prime Minister Rajiv Gandhi on 30 July 1987 at President's House, Colombo. It was claimed by some as an attempted assassination. He later contested a general election under the Sihala Urumaya party in 2000. The Liberation Tigers of Tamil Eelam (LTTE), a separatist militant organization formerly based in northern Sri Lanka, had various organizations affiliated to it. These include charitable organizations, political parties, state intelligence organizations and even governments of Sri Lanka and other countries. Although the LTTE was militarily defeated in 2009, the Sri Lankan government alleges that a number of foreign-based organizations are still promoting its ideology. The Tamil Eelam Supporters Organization (TESO) was an Eelam Tamilsupporters organisation founded in Madras on 13 May 1985 with Dr. Kalaignar Karunanidhi as President and K. Veeramani and Nedumaran as members for the establishment of an independent Tamil Eelam in the northeast of Sri Lanka. The following lists events that happened during 1987 in Sri Lanka. 1 2 "Asia Times: SRI LANKA: THE UNTOLD STORY Chapter 35: Accord turns to discord". www.atimes.com. 1 2 Pike, John. "Liberation Tigers of Tamil Eelam (LTTE) / World Tamil Association (WTA)". www.globalsecurity.org. 1 2 The Peace Accord and the Tamils in Sri Lanka.Hennayake S.K. Asian Survey, Vol. 29, No. 4. (Apr., 1989), pp. 401–415. 1 2 Laskar, Rejaul (September 2014). "Rajiv Gandhi's Diplomacy: Historic Significance and Contemporary Relevance". Extraordinary and Plenipotentiary Diplomatist. 2 (9): 47. Retrieved 8 March 2018. ↑ "Rediff On The NeT: Ashok Mitra on how Indira Gandhi sowed the seeds of hate". www.rediff.com. ↑ "Research and Analysis Wing. Fas.org". ↑ "The Colombo Chill". Bobb, D. India Today . March 31, 1986. p95. 1 2 "Chapter 8". www.uthr.org. ↑ "Web Page Under Construction". www.tamilnation.org. ↑ "Indian Air Force in Sri Lanka.Operation Poomalai – The Jaffna Food drop." Bharat-rakshak.com Archived 2011-06-09 at the Wayback Machine . ↑ "Operation Poomalai – India Intervenes" Bharat-rakshak.com Archived September 7, 2006, at the Wayback Machine . ↑ "Sri Lanka's Ethnic Conflict: The Indo-Lanka Peace Accord". Ralph R. Premdas; S. W. R. de A. Samarasinghe, Asian Survey, Vol. 28, No. 6. (Jun., 1988), pp. 676–690. ↑ "Indo-Lanka accord is a sound framework, say experts". The Hindu . 13 January 2013.